Few have meant more to the animals of our community than Robert and Jane Grace and the Grace Family. The Grace Society has been established to honor this incredibly generous and compassionate family and to recognize current major supporters whose leadership in giving advances Peggy Adams Animal Rescue League in fulfilling its mission. The Grace Society recognizes donors to our annual operations who contribute $1,000 or more in one given year. Today, you are invited to join the exclusive Leadership Circle. The Leadership Circle is made up of Grace Society members who have expressed their intent to support our annual operations for five or more years. These ongoing commitments ensure that Peggy Adams Animal Rescue League can meet the critical needs of the animals and provide a vital foundation of financial support. Multi-year commitments ensure that Peggy Adams Animal Rescue League will be able to move forward on a path of continued and sustainable growth to help more animals and to be a leading animal welfare organization both locally and nationally. 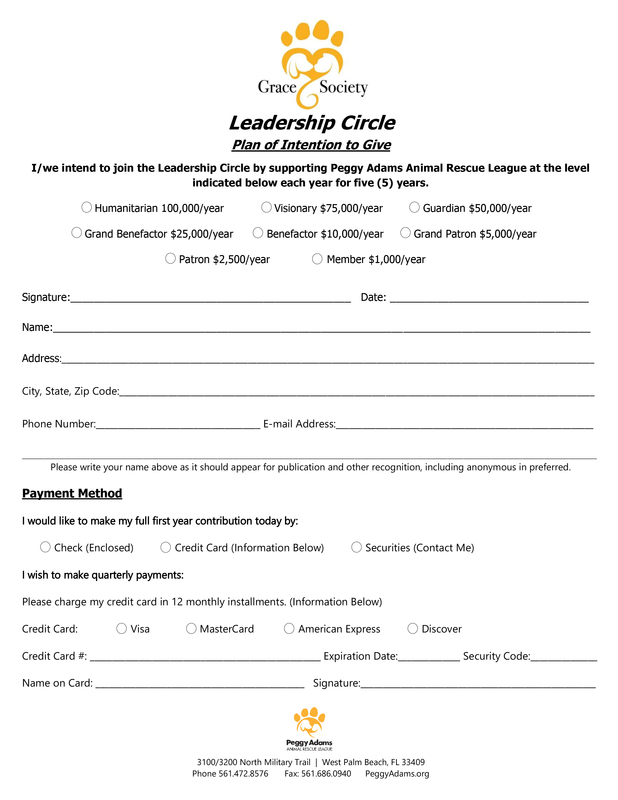 ($1,000 for the year), you can join the Leadership Circle. As a member of the Leadership Circle, you will play a vital role in the life of Peggy Adams Animal Rescue League and, more importantly, in the lives of the dogs, cats, puppies and kittens who need and deserve a second chance at life. Together we will succeed in building a community where there are no more homeless pets. For more information, please contact 561-472-8576 or email us.